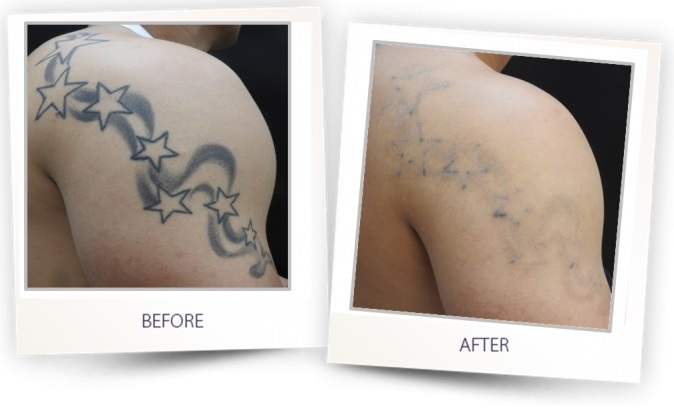 Laser tattoo removal in Lucknow refers to the non-invasive removal of tattoo pigments using Q-switched lasers. Tattoo consists of thousands of particles of tattoo pigment/ink suspended in the skin. While normal human growth and healing will remove small foreign particles from the skin, tattoo pigment particles are permanent because they are too big to be removed. Laser treatment works on principle of selective photothermolysis (heating the tattoo pigment without harming the surrounding skin), using tattoo ink as target. Laser treatment causes tattoo ink/ pigment particles to heat up and break down into smaller pieces. These smaller pieces of tattoo ink are then absorbed by the body over the course of several weeks. The result is that the tattoo is lightened over time. Laser tattoo removal is not an eraser, as many tattoos will not be completely removed. laser tattoo removal requires number of treatment sessions, typically spaced 6 to 8 weeks apart. Professional tattoos may require 6–8 sessions, whereas in amateur tattoos (use less ink and placed superficially in skin) 3–5 laser treatments are effective. Yellow, red, green and fluorescent inks are more challenging to treat. Blue, black and darker colored inks can be removed more completely. The more ink colors in the tattoo, the more difficult it is to remove. Thanks to new technology, laser removal of tattoos is safe and effective. At dermaklinic our focus is on tailoring our medical retreat packages to the specific needs of our clients and we are the best Laser Tatto removal in Lucknow . We pride ourselves on ensuring a rewarding outcome through a unique service model: providing high-quality, affordable health care services abroad coupled with a world-class escape after that.